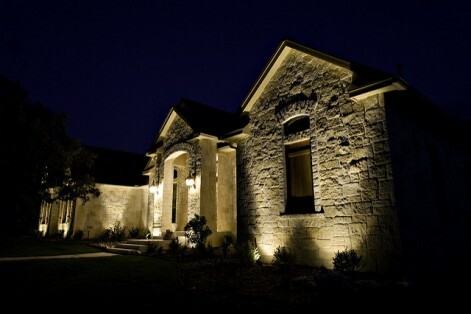 Are you using outdoor lighting to maximize your home’s visual effect? How about using it to increase your overall home security? Let’s spend some time delving into your options and exploring how outdoor lighting can add beauty and safety to your home right away. Beyond a porch light, how are you currently using outdoor lighting at your home? Are your lawns, pathways, driveway and other entrances illuminated? Are all sides of your home illuminated at night? Is your current lighting bright enough for you to clearly see when you are outside in the dark? Is your lighting sufficient to actually see an animal or a prowler lurking in the night? How does your lighting enhance your home’s architecture and design? How does your current outdoor lighting showcase your garden after the sun goes down? These are a few of the things you should be thinking about when considering your outdoor lighting options. Have you ever driven by someone else’s home in the evening and noticed how light is positioned in just the right way so as to accentuate windows, doorways, landscaping and walkways? More likely than not, this is a deliberate play on light for aesthetic reasons. Many smart homeowners also position the same lighting in such a way as to assist outdoor security cameras and just to make it generally easier to see who (or what) is lurking around a home after the sun goes down. No matter the size of your house or yard, you should begin thinking about ways to use light as a design element AND a security tool right away. Turn the page and we’ll address concerns about exterior lighting and then discuss some of the solutions and options we recommend.